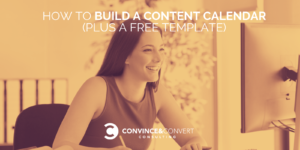 Creating a content calendar from scratch is one of those tasks that seems so much more complicated than it actually is. Even just opening a blank Excel spreadsheet can feel overwhelming. Thankfully, sometimes all that’s needed to get on the right track is a quick how-to and a great starter template, which is exactly what we have for you here. In this post, we provide a guide to building a content calendar, plus a free template for the year. Before we jump into calendaring our content, let’s talk about what a content calendar actually is and a few baseline requirements for success. Gain inter-and cross-department alignment: Inform everyone about what is being published, when and where, so there are no surprises or duplication of efforts. Get a 50,000-foot view of content: Create a clear visual of how your content is distributed throughout the year. Identify content milestones: Plan content around key events or important dates. Spot content gaps: Gain a sense of what content still needs to be planned, with plenty of lead time to line up more content. Inform the content creation workflow: Make sure you have your content ready in time to actually publish when needed. Consistency is insanely critical to content success. Yes, amazing new ideas and brilliant sparks of creativity help, but we can’t rely on them alone. They’re too inconsistent and unreliable. Instead, everyone needs to be on the same page with what content is being created, plus where and when it’s being published. It has to be done on a regular, ongoing basis. That is precisely where content calendars come into play. The further ahead you plan, the better positioned you will be to produce a consistent flow of content. Open your calendars to everyone: While not everyone should have the ability to edit a master content calendar, everyone should at least know where the content calendar is located and have viewing access. Iterate constantly: A content calendar is a living, breathing document, and it should change and grow as your content needs do. There’s no one right way to calendar your content: There are a million different methods, templates and approaches to take. We’re providing you with a baseline template and a proven process that we use for ourselves and Convince & Convert clients, but you should also play around with the approach and modify elements, as needed. We tinker with it all the time too. Create a content repository: Don’t get stuck on ideas that you can’t implement immediately and don’t get hung up on the “we’ll never be able to do that” ideas. Instead, create a repository of content ideas that you can tap into whenever needed. Fantastic! Now that we have all of that out of the way, let’s get to the good stuff: calendaring all of our amazing content. There’s a lot of focus on creating new content when we should really be focusing on creating more with less. It’s also usually not necessary to produce all your content from scratch since we often leave heaps of valuable content just lying around. Slide decks: Repurpose these as videos, blog posts or key takeaway slide decks. First-hand data or research: As long as you use that data safely and in ethical ways, leverage your own data or research to create infographics or news stories. Colleagues and coworkers: The expertise of your colleagues can be tapped for video, audio or transcribed interviews. Whitepapers or reports: Break big content pieces into a series of blog posts or social takeaways. We call this content atomization, which we’ll dive into in just a bit. Old blog posts: Make minor adjustments and update with fresh information. If they’re all on the same topic, combine them into an uber-post or whitepaper, which is a process we call reverse atomization. Repurposing content assets takes away some of the strain of having to come up with a million new content ideas. It also helps you efficiently fill gaps in your content schedule. A single content asset can also often give rise to several pieces of content, which we refer to as content atomization. It’s the process of taking one big piece of content and spinning it out into eight smaller pieces of content. For example, an infographic can support a blog post that analyzes the integrity of the data on which it was based. You could also include a video which explains the wider ramifications of its findings – so on and so forth. Content atomization will become your best friend when it comes to content calendaring, so get to know a bit more about it, plus get amazing examples and inspiration here: 49 Tactics to Atomize Your Content Marketing. If you’re not familiar with Jay Baer’s concept of creating content shows, you can read his in-depth post about content shows. If you’re already familiar or just want the highlights, content marketers need to start to think like television networks and create content shows. In short, these content shows become predictable, steady initiatives that our audiences can rely on and recognize. In fact, these shows are something that they actually look forward to. Binge-worthy shows: These shows are big, steady ongoing content initiatives that have the same theme and format. Otherwise, they should target at least two audiences. They’re not worth the time or effort to produce. These are often podcasts, video series, webinar series, white papers, reports, etc. You should be able to execute this show at least twice per month. These also get plugged into your calendar first. Binge-worthy show example: I’m a massive fan of Retro Replay, a relatively new weekly YouTube show that pits two of today’s most well-known video game voice actors against some of the most difficult and/or nostalgic video games of the past. It premiers live every Thursday at 4:00 pm PT and includes a live chat with the hosts. Aside from being super fun to watch, this show is also a fantastic case study for what a true binge-worthy show looks like and for how to build and engage with an audience. Seriously, check it out. One-time shows: These shows are special quarterly or yearly shows that attack a major customer pain point or topic. Although they’re less frequent in cadence than binge-worthy shows, they’re still fairly large content pieces. Think white papers, research papers, contests, user-generated content campaigns, etc. These don’t have to have the same level of consistency, but they should still be in line with your branding, voice and tone. One-time show example: Who doesn’t love CMI’s annual Benchmarks, Budgets and Trends report?! This yearly report is chock-full of goodness. Even though the report varies slightly in design and layout each year, it’s consistent enough that audiences know exactly what to expect. Regularly scheduled programming: These shows are ongoing content initiatives that round out your calendar, and they don’t have to necessarily connect completely or be 100 percent consistent in theme. Like in the case of blog posts, they may have a different author, topic or format, depending on the content, but they always connect back to the content strategy and have at least one clear audience in mind. Think of them as what a local nightly news show is to any major television network. Regularly scheduled program example: Convince & Convert’s own blog is our version of regularly scheduled programming. We have our weekly ON newsletter (binge-worthy show) and our big masterclass courses (one-time shows), and then we have our blog to help round out the calendar and provide ongoing information (regularly scheduled programming). It’s important to note that you most likely already have content shows in your existing content assets, so check your inventory first. It may just be a matter of spinning assets a bit differently, giving them an official show title or connecting them in more consistent ways. If you don’t have any shows in your existing content assets, or you need more shows to round out your calendar, then you’ll want to focus on creating new content shows. Regular editorial planning meetings between all those involved in content creation should be scheduled well before the next publishing period—be it monthly or quarterly. This meeting can be used to schedule the publishing content from your repository with realistic time frames and to support social media activity, email newsletter inclusions, etc. Your planning meetings can also be used to review the visit, engagement and revenue (if available) stats from previous periods to assess which types of content are most successful (and perhaps need to be replicated) and which are less successful (and perhaps need to be rethought). Analytics (both web and social) and revenue data can also be used to make tweaks to already published content (e.g. titles, introductions, outbound links, etc.) to optimize visits and engagement. We’ve provided a basic content calendar for you to use. While there are a ton of amazing, wonderful content calendaring platforms and tools, we’ve opted for an Excel spreadsheet. That’s because it’s a great starting place, easy to edit and modify, and almost everyone has the ability to open the file. Start with binge-worthy shows: Add these into your calendar first and make sure to pay attention to any key dates or big events. Add your one-time specials: Pay attention to how they overlap or complement your binge-worthy shows. Round it out with regularly scheduled programming: Last, but definitely not least, add in your regularly scheduled programming. These should help fill any gaps in your cadence and keep content consistent. Add content to the content repository: Don’t have a place right now in the calendar for some great ideas? Add it to the repository. Let this be your storage solution for great ideas and check back on it often. That’s it! Now you can edit and update it, as needed. The actual calendaring part is pretty quick, once you get your shows established. Now, bring this to your editorial meetings and make sure to keep tabs on how content is performing, so you can adjust your publishing flow and content ideation, as necessary. Happy calendaring! This post was originally written by Jamie Griffiths in 2014, and extensively updated by Anna Hrach, Digital Strategist here at Convince & Convert, in 2019. Jamie is the inbound marketing strategist at London based digital agency Manifesto. He writes on search and social media for the Manifesto blog.